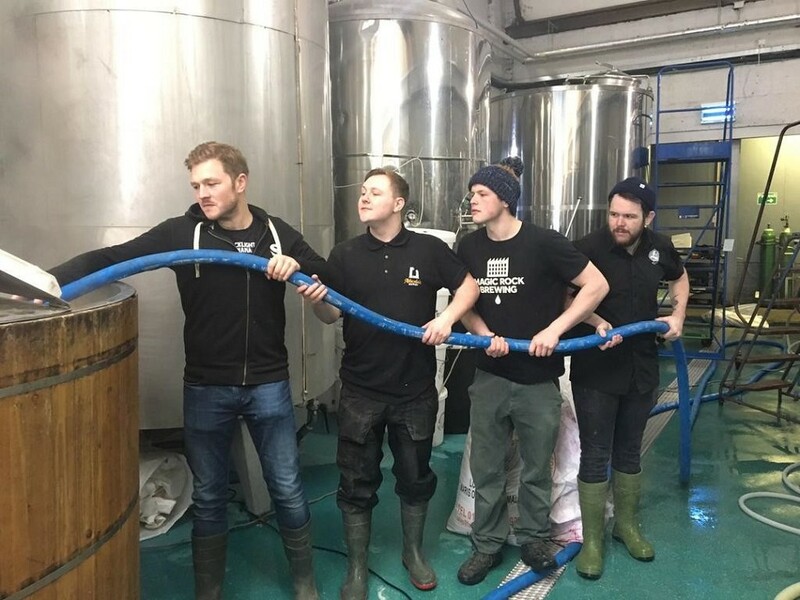 Collaboration time again here at Abbeydale – and this time it was a particularly special one for us as it meant a reunion day in the brewhouse too! In our first EVER four-way collab, three guys who spent time at Abbeydale earlier in their careers returned for one day only… Dave Kerr from Northern Monk, Richard Morley from Magic Rock, and Sam Lee from Siren all back in town, teaming up with our very own Jamie Memmott to create a hop forward, super juicy IPA that's bound to knock your socks off. We've got a pretty damn extensive hop store here, and the guys had free reign over the shelves. They've gone for four absolute powerhouses of the humulus lupulus world – Nelson Sauvin taking centre stage, backed up by Amarillo, Cascade and Galaxy, to provide a massive hit of gooseberry and grapefruit flavours with floral notes, passion fruit and orange lingering on the palate. It was a great day having the old gang back together, and definitely an eventful brewday (particularly as Sam brought us all some of Siren's new release Bourbon Milkshake, an 11% milk stout, to try, there's probably a good reason why this isn't described as a breakfast beverage) with everyone pitching in and Morley up to his usual tricks of trying to fix everything (even when it wasn't necessarily broken…) Speaking of pitching, our house yeast has been replaced in this brew by US-05, which accidentally ended up on a van having a little tour around Sheffield shortly before it was needed in the beer! Thankfully our driver brought it back just in the nick of time and it's now happily fermenting away. We are mega excited to find out how this beer, named "4 Degrees of Separation", turns out! Keep your eyes peeled for details of where this will available soon... we have a feeling it won't be around for long!